After a fight with Kapil Sharma, Sunil Grover announces show in the capital city Delhi on, April 1 with Kiku Sharda. Sunil announced about his upcoming show details on Facebook leading another twist to ongoing controversy. Two famous characters, Mashoor Gulati and Bumper will entertain Delhiites on April 1. 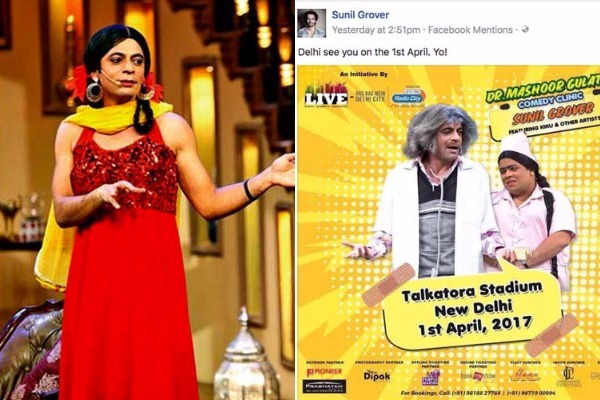 Here is the announcement made by Sunil Grover with the caption, “Delhi see you on the 1st April. Yo!”. Sunil is seen as Dr Mashoor Gulati and Kiku Sharda as the nurse Bumper. Eventznu assumes, that Mashoor Gulati is cleverly taking advantage of building himself from the downfall of Kapil Sharma Show and, love and support he is been receiving from everyone. If the show in Delhi goes well, we never know Sunil Grover may replace Kapil Sharma in coming days. Well played Sunil Grover. Guys, what do you think, will comedian Sunil Grover along with Bumper will be able to run the show successfully? Also Read: After Sunil Grover, Is Chandan Prabhakar aka Chaiwala Too is Boycotting ‘The Kapil Sharma Show’?